Transit-Oriented Development (TOD) refers to the investment that takes place at and around transit infrastructure. One of the most important types of TOD for improving the quality of life of our region’s residents is housing, and certain types of housing create an even bigger boost to the functionality of our transit system and the success of our entire region. Transit-oriented development supports the economic growth in the bi-state area, but it also has the power to deliver valuable resources for key segments of the region’s population: senior citizens and working families. The U.S. population is getting older. It’s estimated that by the end of 2029, there will be over 70 million seniors – representing about 20 percent of the country’s population. In the bi-state area, there is a unique opportunity to support this population growth by leveraging the public transit system to enhance the quality of life for seniors through age-friendly housing and greater accessibility. In the St. Louis region, the senior population is expected to increase by 77 percent over the next 30 years, and by 2045, it’s predicted that one out of every four people in the region will be over 65 years old. In St. Louis County, seniors already make up around 43 percent of the total population, or nearly 450,000 people. For many of these seniors, driving a car is often not possible, which may lead to isolation, difficulty getting to health appointments and other critical services, and a general reduction in independence. When seniors are able to live near transit, they are able to forgo driving without losing their independence and mobility. Age-friendly developments and facilities where seniors can receive long-term care, participate in the community and receive other needed services are increasingly in demand. 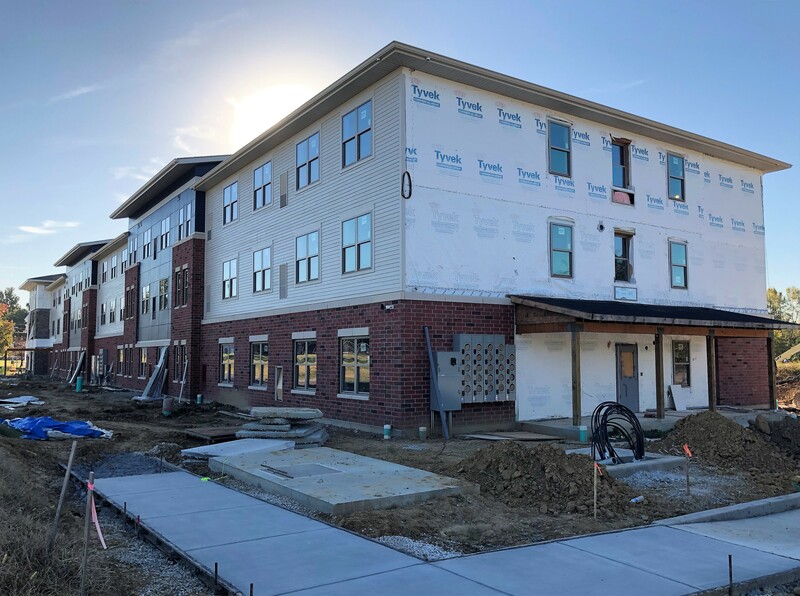 One such example is Metro Landing at Swansea, an affordable, active senior living apartment project developed by the Southwestern Illinois Development Authority and Bywater Development in partnership with Bi-State Development. Seniors who will soon live in the 62 units at Metro Landing will live just a few steps from the Swansea MetroLink Station and the MetroBikeLink pedestrian/bike trails in St. Clair County, Illinois. Quality of life can also be greatly improved for working families, especially those living at or below the area median income, by living near public transportation. Access to quality transportation is a key driver of economic success, according to a recent Harvard study. In fact, commute time is the single strongest factor in escaping poverty. Based on a customer survey in 2015, about 41 percent of Metro Transit’s riders reported an annual income of under $20,000, and 37 percent do not own a car. The availability of affordable housing to people at or below median income near transit enables healthier, more productive lives, while also increasing ridership. For many families living with financial stress, using public transit for some or all of their trips can allow households to avoid purchasing an additional car – or any car at all – so they can cut their costs substantially without cutting their ability to get around. Bi-State Development is currently analyzing the feasibility of workforce housing along the potential Northside-Southside light rail alignment through the Northside Southside TOD Study. Metro Transit is also planning to introduce 13 high-frequency bus lines to its network through its Metro Reimagined service plan, which may lead to the development of senior and workforce housing along these corridors. When the region plans high-quality TOD projects near its transit centers, it contributes to a more equitable, accessible and economically successful St. Louis region.